As expected, the thespians of HSE produced yet another fantastic production for the annual Spring Musical. 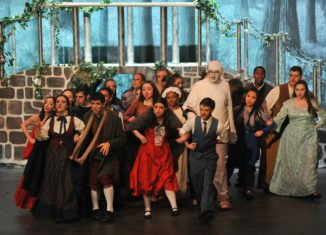 This year, the High School East Players presented Into the Woods on March 23 and 24. 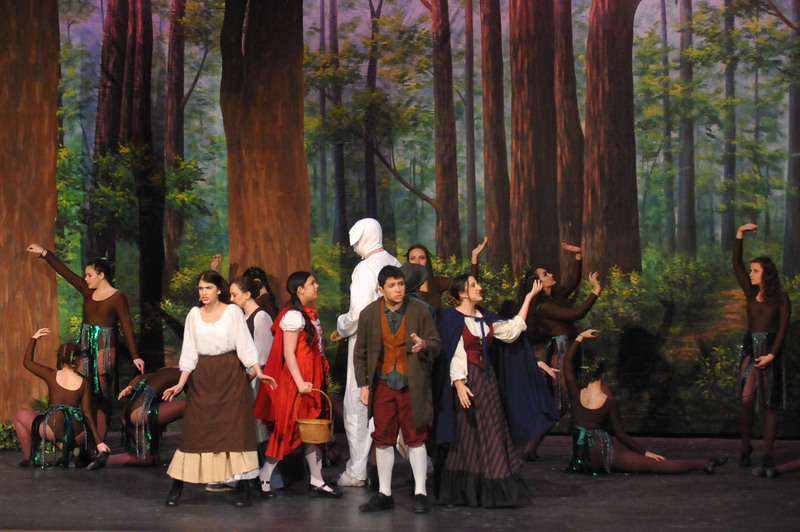 For those who did not get to experience the fantasy and drama of the show, Into the Woods is a magical production connecting characters from multiple fairy tales into one story. Known personalities including Cinderella, Little Red Riding Hood, Jack (from Jack and the Beanstalk), Rapunzel, Prince Charming, and other familiar faces appear throughout the show as the Baker and his wife venture into the woods. Their journey is guided by the hunt for four items: the cow as white as milk, the cape as red as blood, the hair as yellow as corn, and the slipper as pure as gold. If all of these items are found, the Baker and his wife would receive the child that they had always wished for. This enchanted yet mysterious musical was a huge sensation on both Friday and Saturday night. In addition to the cast, the show could not go on without the excellent stage crew and the pit orchestra. With each consecutive year, the sets exceed every expectation, and this year was no different. The crew is unbelievably talented and the cast offers immeasurable gratitude to the people who make it possible to put on a musical each year. Our high school is unique in that, in addition to the acting, dancing, and singing talent, we have an extremely talented, experienced, and dedicated pit orchestra. The music in our productions is very much comparable to the music in the original cast recordings – something that is very hard to accomplish. The talented musicians of HSE make it look easy. In addition to their talented peers, the students have been greatly privileged to work with such influential and creative adults. Co-directors Lauren De Stefano and Danielle McRoy (Dr. McRoy is also the musical director), orchestra conductor Monica Benstock, crew advisors Vikki and Torry Reres, costume coordinator Debbie Parker, choreographer Kylie Ceraolo, and makeup designer Rayna Weil were truly the backbones of our production. On behalf of the whole cast, crew, and pit, we are so appreciative for everything each of you does for us and the show. If it were not for each of you, we would lack all of the tools necessary to present such an unbelievable production year after year. As if it could ever be enough, thank you so much; we love each of you. I am currently a junior, and this is was my first year involved in the spring musical. For years, my friends who have previously been a part of the show have told me how much fun it is and how many memories they made. I did not realize how true that was until this year. Through the musical, I have made so many new friends and had such amazing experiences. The passion for theater and love for each other was so clear and is something that people outside of the production would not understand. My only regret is not doing the musical sooner! I cannot wait for play season again next year and look forward to many more amazing experiences. If you did not have the chance to see the musical this year, or even if you did, be sure to make your way to the auditorium next spring…I promise that you will not regret it, and it will be time well spent!